Let us now praise classy huns. 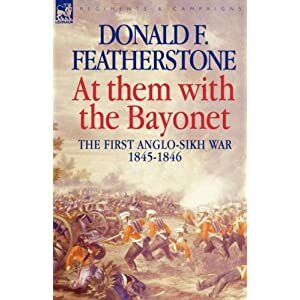 At them with the Bayonet is a popular history by Donald Featherstone written about that most fascinating of conflicts - the First Sikh War. I received the book in the post as a thank you from Peeler for some 1/32 chaps I had cluttering up the place. 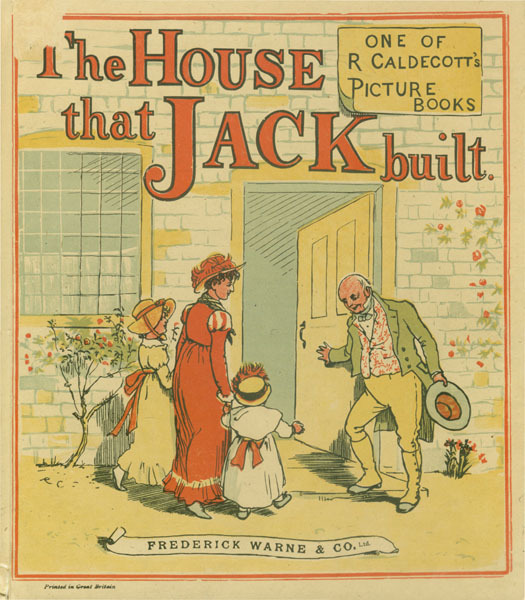 I'd read the companion volume, a strange sort of creature, half history book, half novel - called "All for a Shilling a day" which is about the 16th Lancers in the first Sikh War. I haven't had time to read much of it yet, but I've found it interesting. I was surprised to find Featherstone giving credence to the Martial Races theory - but apparently the Pakistani military are still inclined to it. I've always been of the opinion that "one man is much like another and best is he raised in a hard school." Xenophon, I think, but I'm quoting from memory. Both of these books are available from Leonaur Books, which has a truly astonishing array of title available. I'm become quite addicted to their reprints as they are cheap at just under a tenner and cover a wide variety of subjects, particularly memoirs, where else are you going to find the reminiscences of officers of the Bengal Artillery? I've picked up a few titles on the Mutiny and the Sikh Wars, though I've also noticed that they also reprint old crime, historical and science fiction. Also, order them from Book Depository and postage is free. No news on the house as of yet, but it will have a dedicated wargames room. The "Dissertation Death March" continues on - slow, but steady. My Hottz mats have arrived! Apparently they were delayed in customs and I may have been wronging poor old Eric. More to follow and pictures and a battle and chortling with joy. But, first work and finishing this blasted dissertation. 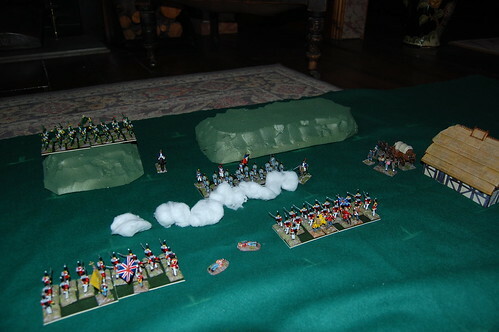 Two Command & Colours style British units (The Connaught Rangers & King's Royal Halberdiers by their colours) engaged in a hot fight with a similar number of Johnny Crapaud. I've organised my Napoleonic forces quite deliberately as set out in Charge!, mainly because I enjoy the constructing of regiments. I get a tremendous swell of pride when I see them deployed in their full glory. I think one of the first things I will do when I finally have a wargames room of my own will be to stage a review. I am therefore rather torn about breaking up my Charge! units into their constituent companies for Command & Colours: Napoleonics. This doesn't bother me so much with the French battalions, but I invest rather more of myself in the redcoats. There is also the tricky matter of flags. Firstly, even if I was to make two additional flags per unit, there would be the matter of which flags. I can hardly have three battalions of the Connaught Rangers. It also means that there will be significant flag inflation on the battlefield and I don't care for twenty odd men clustered around a flag pole. It makes it look like a Colour Party with ideas above its station. One solution is to divest all units of their flags, but that loses some of the visual appeal and an important means of telling one corps from another. It would also make it difficult for my long hoped for "long range Napoleonics" game to be implemented. Key reasons flags were carried was so that the Tommy on the ground could work out his dressing and the general on his horse could tell where the Loamshires had got to. I haven't thought of a way to square this circle. And now, on to the British for Command & Colours: Napoleonics. I have sufficient troops to cover these, however I've always been rather cavalier about light infantry/grenadier "wings", some of my regiments have them and some do not. I may have to rejig this slightly, but as I've commissioned a battalion of the 28th and have another regiment (yet to be decided) waiting in the wings, I don't see any problems on this score. I have three times as many riflemen as I need, staunch German fellows of the 60th Royal Americans. Not entirely sure how to represent these. A single unit with grenadier wings and a hodge podge of facing. I certainly have sufficient figures to pull it off though, it's just a matter of painting them. I don't actually field any Guards units, probably that reverse snobbery of mine again. I do have a regiment of the 4th Foot, who have the requisite blue facings. I have plenty of these. Two full Charge! regiments of the 18th and the 13th and a single squadron of the 6th Light Dragoons of Mathew Hervey fame, I'm in good shape with respect to light cavalry. I've ordered a Charge! regiment of these, though I'm currently debating which unit I'd like them to be. I had intended the 4th Irish Dragoon Guards, but these did not have a good war and as I will need an additional squadron anyway, I thought it might be best to do them as a detached squadron and pick a more distinguished corps for the full regimental treatment. No idea. The Blues or Royals perhaps. Something decently Household cavalry anyway. I'm always transfixed when I see them in London. Fortunately, once the fellows from Newline arrive, I'll have sufficient HAT heavies to kit out the two additional squadrons needed. 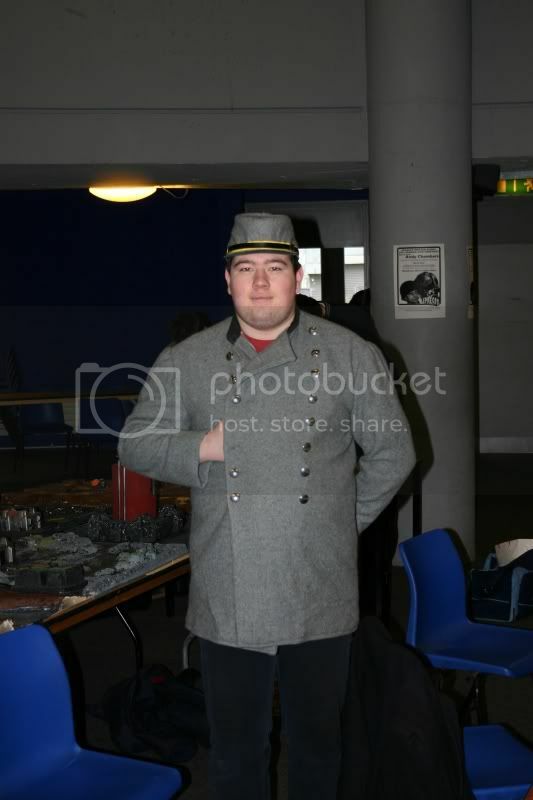 Sean from Newline has provided me with three excellant batteries and I also have an additional Revell battery that appears to have Royal Horse Artillery drivers and Foot Artillery Gunners. Not entirely sure about that one. I have quite a few British officers, including a Wellington and a rather lovely Picton. No problems here. In terms of Horse, Foot and Guns, I have almost all of what I need for the British forces. The first few game will no doubt result in some substitutions, I could for example, use my magnificent Argyll & Sutherland Strelets Highlanders as Guardsmen. They may be Crimean Highlanders, but they are superb. Next step I think is a list of the gaps that need filling, though I may hold off on filling those that cannot be filled using figures that are already on the strength until such such time as I've had a look at the scenarios in the game. With a publication date in November that shouldn't be too far off. Oddly enough for a game whose initial outing will be an entirely devoted to the Peninsula Campaign and the Hundred Days, there will only be pieces for three armies in Command & Colours: Napoleonics, the British, the French and the Portuguese. The lack of Spaniards, who might have done a spot of fighting in Spain, and Prussians, who I believe turned up late on the 18th of June 1815, but who did turn up, has excited some adverse comment*. The explanation for this is of course that there is actually a limit to what you can put in a box and still expect it to sell or more to the point still expect gamers (not the fittest of constituencies) to lift it. Further troops will be released in future expansions (*fingers crossed for Austria and Prussia*), though I'm told the Portuguese will be representing the Prussians in the Waterloo scenarios included in the basic set. I don't think I'll go down that road, but fortunately HAT Industrie have stepped in the breach and should be releasing Prussian infantry in march attack very shortly. I was tempted by Revell's very fine effort in this field, which has the advantage of being currently available, but I think my love of marching figures will win out. But the Portuguese listings are as follows. I am relatively well provided for here. I have a Charge! 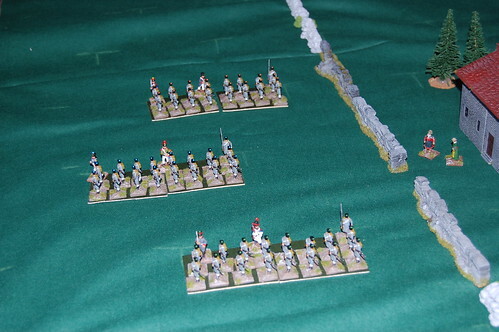 regiment of Portugese Line Infantry prepared, but unpainted. That should cover me for three Command & Colours units. I have some painted chaps in round hats, though technically they may be militia, I think I would rather try and field an Ordenanza unit using a mix of guerrilla and infantry figures. The famed Cacadores. I don't have any, I will probably use British figures with a paint conversion. One Charge! unit would cover the requirements amply. Nothing doing unfortunately, these will need to be represented by British light cavalry in Tarleton which are not currently available in plastic. A Charge! regiment will do the trick. I have no Portuguese artillery and I can honestly say I have no idea what they should look like, beyond a vague belief that they probably wore a shako of some kind. I'll have to dig out the references for this one. I have no Portuguese officers, Field officers wore a uniform very similar to the British one, as for higher ranks I cannot say - another one for the library. As for anyone wondering where the "Pork & Beans" came from, it was a slang term used by British troops during the Great War for their Portuguese allies. Pork & Beans was a common canned foodstuff and supposedly the two sounded the similar. The Portuguese refered to the British as "the Beefeaters". Source, A Dictionary of Slang and Unconventional English by Eric Partridge & Paul Beale. *I write this safe in the knowledge that somewhere Peter Hofschroer is beating an effigy of the Duke of Wellington with a poker, in spirit, if not in body. The 22ieme Ligne deployed as three Command & Colours: Napoleonics units. Like Bob and Donogh I'm a fan of the Command & Colours series. I have been waiting for Command&Colours: Napoleonics for quite some time. I've preordered the game. Now naturally, being a wargamer I have very little inclination or desire to play the game as produced. Fortunately, those kindly souls at GMT games have made a unit list available, so I can get weaving on getting figures ready for all of these chaps. 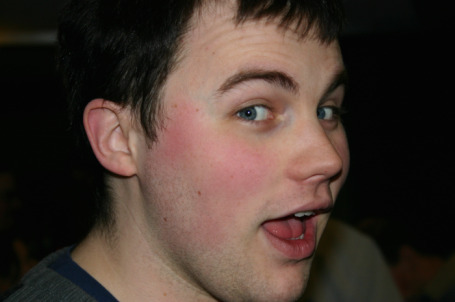 When my chum Gorman is hanged, Eric Hotz will be the tardiest chap who ever promised me a game mat. I have no doubt that it will eventually arrive, but I am beginning to wonder if my grandchildren will want to play with it. Looking at the list below and working on the basis that I want to keep as many figures on the table for as long as possible, I plan to use sixteen men per infantry unit, eight per cavalry unit and one gun per artillery unit. Supernumery figures, officers, sergeants, pioneers and other such harmless persons will indicate the actual strength of the unit. Looking over the list, I'm considering my options. No problem then, I have plenty of French infantry, both in shako and bicorne. An officer, a sergeant and a drummer will be used to indicate the current strength of the unit. Slightly more problematical, I have sufficient figures to field three units of the 3ieme Irlandaise who were light infantry, but an entire brigade of Irishmen might be overegging the pudding somewhat. I think the simplest solution is to put together another battalion of light infantry, which would give me three Command & Colours units. I have some Grenadiers in bicornes, chaps with red epaulets and moustaches. They should do the trick. No idea what to use for these, the Imperial Guard never saw much service in Spain, so I'm not really familiar with them. I shall have to consult my sources. I could put it down to reverse snobbery or just plain laziness, but I don't actually have any chaps in bearskins. Zvesda do a beautiful set, but I would have to buy multiple sets to get even a single unit in one pose. Newline Designs I think. This is a hard one, I thought about using my bicorne chaps, but that doesn't really make sense. I suppose I could convert a few other ranks so that they're wearing tophats or clogs or something equally unmilitary. I have sufficient Chasseurs and Hussars to cover these requirements twice over. I have a Charge! style regiment of 13ieme Cuirassiers, which should do nicely with an extra unit to spare. I have no idea what I should use for these chaps, time to consult the Osprey and make another call to Newline I think. I can use my magnificent Zvesda French Foot Artillery. No problems here, I may have difficulty fitting limbers on the field. I think what I will do is have the number of blocks represented by the number of crew and leave the gun model on the table when the unit is wiped out. I have a variety of mounted French officers, though since the game includes a Waterloo scenario, I suppose I shall have to paint up my model of the Corsican Ogre himself. It must be said, despite a few niggling little gaps, I am in good shape and should be able to play the game with miniatures as soon as it arrives. Next: The Pork & Beans. if they can be got cheaply. 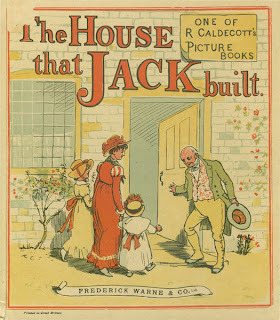 One piece of news that rather slipped my mind is that Mrs. Kinch and I have had an offer accepted on a house. It was house number 26 of 30 viewed and contrary to all previous experience, it has all its windows and doors and a roof and such. We had our offer accepted with indecent haste, though a structural survey indicates that there is nothing wrong with the property. There is a lot to happen before the scene above can come close to reality, mortgage re-approval, much flying back and forth of documents and such - but it is rather closer to being the proud owners of Chateau Kinch sur la Tolka than we were. That is of course, assuming all goes well. The last ten days have been rather frustrating. I had taken leave to finish my dissertation and came down with a rather nasty chest infection the day after. I was able to soldier on somewhat and while I was feeling rather grim, I managed to make some progress each day. I was prescribed antibiotics, new shiny antibiotics, that I proved to be allergic to - now to give them their due my chest problems cleared quickly, but were soon replaced with a sweating, shivering and generally unpleasent state of being where it was unwise to stray too far from a bathroom. The cure took rather more out of me than the disease - I'm down about four pounds I think, perhaps a trifle more. I am, God be thanked, back on my feet - but I am lamentably short of time in which to finish my dissertation. There will be plenty of hard pounding over the next two weeks in order to put things in order. I did divert myself a little while bedridden, reading a great deal of Saki, which I thoroughly enjoyed and preparing a unit of John Cunningham's Sikh Akali for the forces of the Rajah of Kaala-Akhaati. These were based and undercoated very quickly and passed on to a friend of mine who does a spot of painting on the side, along with the first compoo of the Rajah's European trained regulars. While Mrs. Kinch returns to the kitchen to the strains of Flanders & Swann and the Comedian Harmonists - I ponder a question that has been taxing me for a while. Donogh and I had been thinking about the problem of modelling ammunition consumption in a wargame, particularly 20th century wargames, where morale is often inextricably linked to the supply of the ammunition, as Cooper put in in Dog Soldiers "...high spirits are just no substitute for eight hundred rounds a minute." The discussion came about because we were talking about the possibility of adapting Memoir '44 to the rather smashing Very British Civil War. This is of course, the very kind of conflict where ammunition supply is key, due to the ramshackle logistical tail and the brittle morale of the militias and other enthusiastic amateurs that make up the majority of the fighters. The idea was to have each side be given a certain number of fire units which are consumed when units shoot. There was also the possibility of assigning special fire units to particular weapons, e.g. artillery and mortars. If a player intended to shoot, he must hand over a fire unit to his opponent. As I am a great believer in gimmicks, the plan was to use spent brass as fire units, with larger calibres representing special weapons. An additional wrinkle would be to give the player a look at how many fire units he has and then place them in a box from which he must draw blindly, keeps a rough mental cost of how much ammunition he has remaining. While it is unlikely that the Very British Civil War project will ever get off the ground, I would like to give this idea a go with my Horse & Musket forces. 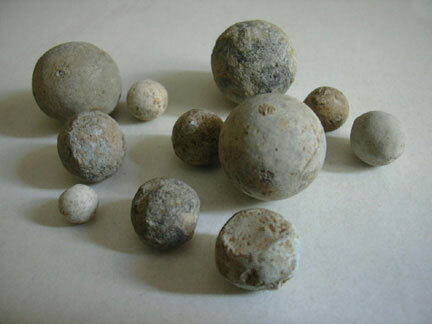 Which begs the question, where does one get musket balls in this day and age? Bearing in mind that I live in a state where firearms are strictly controlled and black powder firearms are virtually unheard of. Any advice my American and Canadian chums? one of our greatest fictional malingerers. After three weeks of feeling distinctly sub par and harassment from Mrs. Kinch I finally took myself to our local sawbones, who looked me up and down and told me it was "probably a virus" and to get plenty of bed rest, which I've been doing - though "probably a virus" is a very irritating illness as it demands that you don't do anything, but doesn't have the decency to have a proper name. 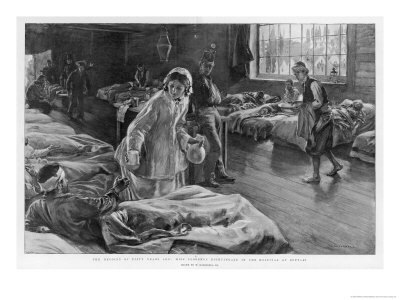 With any luck I might get a perfectly respectable disease in the mean time - the French Pox perhaps? This has led to a shocking lack of progress on my dissertation which is proving to be a concern as well as the growing mountain of paperwork I have waiting for me. I managed to work in a little idle toy soldiering last night in between bouts of being locked away like a tubbier version of Mrs. Rochester. I based twenty one of Mr. John Cunningham's Sikh Akali last night while watching "Planet of the Apes" and then returned to bed, panting from the exertion. There will be pictures to follow, but essentially the process is as follows. Cut 5/8 inch square of plastic card. Glue Johnny's feet to the plastic. Apply mastic or filler to the plastic card covering up Johnny's metal base. Glue a square of magnetic material to the plastic card so that the chaps can be kept in A4 file boxes lined with steel paper. These chaps will probably form part of the palace guard of Kaala-Akhati. Mrs. Kinch is being terribly cheerful at present as she's having fun in the kitchen on the occasional of a birthday party on the premises this evening. She's just bustled in bearing anti-biotics and a bowl of Eton Mess for me to review before she serves it tonight. I think I'd better be going. I watched Quentin Tarantino's "Inglorious Basterds" the other day. It is an interesting film, though not one that gripped me - the interest being in the deconstruction. Tarantino has made a "Macaroni Combat" film. This was a new genre to me and while I have always enjoyed Spaghetti Westerns, I don't think the war movie equivelant holds much appeal. I enjoyed "Inglorious Basterds" though I don't think it will get a second viewing - it's a very slick piece of work, beautifully photographed and with some very professional acting. Christoph Waltz is superb as chatty, charming Jew hunter Hans Landa. 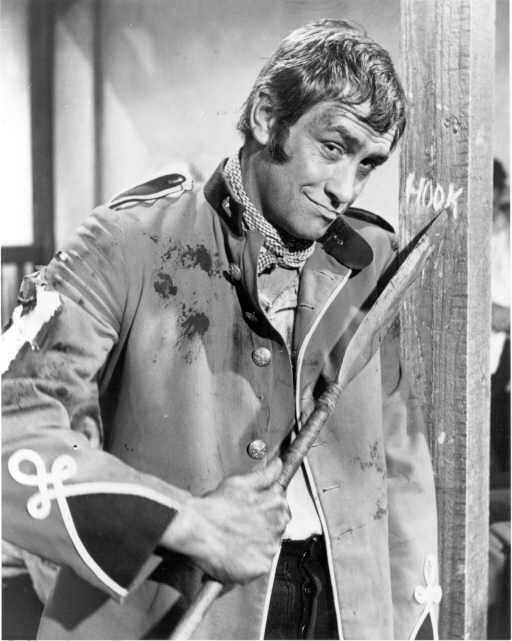 I was tickled pink when I discovered he had won an Oscar for the role, beating Christopher Plummer - a man who has got a lot of wear out of a German uniform over the years. Spaghetti Westerns are typically set in the borderlands between Mexico and the United States, but they are generally deliberately vague as to the details of time and place, characters are often abbreviated, we need to know very little about the man with no name to understand his purpose within the tale. The Spaghetti Western has an abstract nature and is entirely self contained, it needs no context to work as a story. Basterds on the other hand, is too chatty by half (the excellant Waltz aside), filling in details of time and place, rooting itself in the particular all of which makes the flatness of its characters all the more apparent. Simple characters are not a flaw in a film that is structured to take advantage of their simplicity, like 300 or Once upon a Time in the West for example, unfortunately Basterds is not that film. The film itself is a revenge fantasy - a common plot for Spaghetti Westerns, but one that seems too petty to really work for a Second World War film; and this I think is one of my major problems with the piece. There is a gleefullness to the violence that is quite adolescent - a revelling in barbarity that prompted a friend of mine to sum up the film as follows "Take eight Jews, build a better Nazi, profit". I've also heard Basterds compared to the war comics of the 1970s and 1980s, but I don't think the comparison is fair. War comics certainly revelled in violence, but they also focused on courage, self sacrifice, friendship and a sense of things not done. Their simple and not unworthy morality is completely lacking from the "Basterds" - Lord Peter Flint never scalped a fallen foe. Is "Inglorious Basterds" worth seeing - yes, it's certainly better than many films out there. It is beautifully shot and there are some performances that repay study. There are also plenty of interesting nuggets for film buffs. Does it have anything of worth to say about the Second World War? I doubt it. If you want to see a better film, I would recommend Elim Klimov's "Come and See" or Sam Peckinpah's "Cross of Iron" - films that are far more eloquent about savagery than "Inglorious Basterds" could ever hope to be.